U.S. Sens. 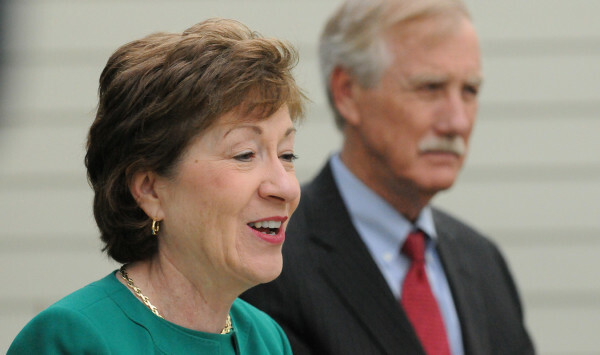 Angus King and Susan Collins speak during a press conference at the Margaret Chase Smith Library in Skowhegan, May 16, 2014. Despite her push to delay efforts to repeal the Affordable Care Act, U.S. Sen. Susan Collins joined her Republican colleagues early Thursday to adopt a budget plan that would end the program and remove the threat of a filibuster by opponents of the move. Maine’s junior senator, independent Angus King, said the Senate “made a serious mistake tonight” in its 1:30 a.m. adoption of the measure on a party line 51-48 vote. King said the move “will have disastrous consequences for tens of thousands of people in Maine and millions more across the country,” including more than 75,000 Mainers who get their insurance through the program, popularly called Obamacare. Collins has taken the position that Republicans, who control both houses of Congress and will soon hold the White House, shouldn’t end the health care program until they can offer a replacement program. President-elect Donald Trump on Twitter congratulated the Senate for its vote, adding “now it’s onto the House!” Only one Republican, Kentucky Sen. Rand Paul, joined Senate Democrats in opposing the resolution. The House of Representatives plans to vote on the measure Friday, Speaker Paul Ryan said, pushing ahead despite concerns among some Republicans about launching a repeal before building a consensus about how to replace the complicated and far-reaching Affordable Care Act, dubbed Obamacare. House members are under “no hard deadlines” for producing an alternate program, Ryan said Thursday. Speaking to reporters, Ryan said House Republicans will have an in-depth “conversation” about health care legislation during a retreat in Philadelphia at the end of this month, but that the House nonetheless will kick off the complicated process with a vote on Friday on the Senate-passed measure. Trump said Wednesday he intends to offer an alternative that could be voted on “essentially simultaneously” to the repeal of the Affordable Care Act. He has often said it will be cheaper and better but hasn’t outlined any details. The budget blueprint that won approval by the House and Senate is a reconciliation bill that lays out spending-related items and can’t be filibustered, effectively depriving Senate Democrats from prevailing unless they can sway at least a few GOP lawmakers. The measure, which is not a law but merely guidance for Congress itself, gives congressional committees until Jan. 27 to come up with repeal language to end Obamacare. Passage would permit follow-up legislation to escape the threat of a filibuster by Senate Democrats. King said the move will “substantially harm rural hospitals” across Maine and make health care harder to get. Collins said Tuesday that “repeal and replacement is a complicated task” and insisted her chief concern is to make sure there is no gap in coverage for people who rely on Obamacare for their insurance. The Center for Budget Policy and Priorities estimates 95,000 people in Maine could lose their insurance if Obamacare is repealed. More than 20 million Americans rely on the program. Before adopting the measure, GOP senators shot down a long list of proposed amendments from Democrats, including a bid by King to ensure access to affordable health insurance for people who work in high risk occupations such as forestry, farming, fishing and public safety. “This is a disappointing blow to people who work in rural communities across Maine — our state’s fishermen our farmers or our forestry workers, just to name a few,” King said on the Senate floor.